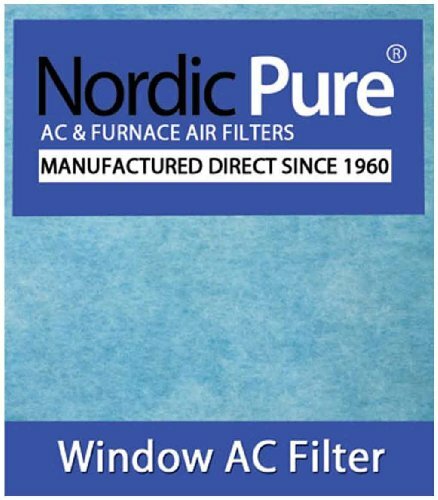 The Nordic Pure Window AC Filter 15 by 24 pad is a convenient size that fits most room air conditioner units. However, if that doesn't work, just cut the filter to fit your window unit. The electrostatically charged material in Nordic Puree's AC window filter will reduce dust, dirt, pollen, mold spores, pet dander and other allergens from your indoor air. This air filter replacement will provide you with fresh and clean air while increasing the efficiency of your unit. It is recommended that the filter be replaced every 30-60 days depending on your living environment. This filter can be used as a replacement filter for part numbers AC-302, F1524, F1663, FG11524.25, KK500, 9808, and 1285234..